1974-03-01. New. Ships with Tracking Number! INTERNATIONAL WORLDWIDE Shipping available. Buy with confidence, excellent customer service! London, United Kingdom: New English Library, 1973. Book. Fine. Hardcover. 1st Edition. First UK Edition, First Printing. 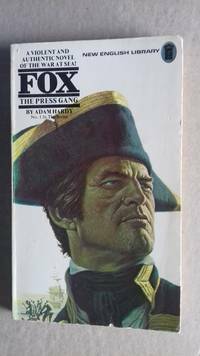 This is a true first edition, first printing (first impression) Exceptionally scarce first hardback edition of Adam Hardy's two stories 'Prize Money' and 'The Press Gang' which first appeared in paperback format in 1972. Fine condition in a very good plus jacket with rubbing to the extremities and chipping to the upper spine. 1974-03-05. Good. Ships with Tracking Number! INTERNATIONAL WORLDWIDE Shipping available. May not contain Access Codes or Supplements. May be ex-library. Shipping & Handling by region. Buy with confidence, excellent customer service! 1974-03-01. Good. Ships with Tracking Number! INTERNATIONAL WORLDWIDE Shipping available. May not contain Access Codes or Supplements. May be ex-library. Shipping & Handling by region. Buy with confidence, excellent customer service! New English Library. PAPERBACK. 0523002106 New Condition. . New. U K: New English Library, 1975 No creases to the front cover. No creases to the spine. One very light and mild surface crease running alongside the spine to the back cover. 110 firm pages. Pages browning lightly to the edges, more so to the ffep. A tight,flat and firm book. A very good copy of this paperback collectable. New English Library. PAPERBACK. 0523002106 Like New Condition. . Fine. UK: New English Library, 1975. PBO. creased. 1cm spine split. binding tight. . First Edition. Mass Market Paperback. Good. 12mo - over 6¾" - 7¾" tall. New York: Pinnacle Books, 1974. Light edgewear. Light soiling. Light rubbing. Book slightly cocked. Browning. Has been stamped on first page. . 1st Printing. Mass Market Paperback. Good. 12mo - over 6¾" - 7¾" tall. New York: Pinnacle Books, 1975. First USA Edition, First Printing. Soft Cover. Good Plus. New York: Pinnacle Books, 1974. First USA Edition, First Printing. Very Good. New York: Pinnacle Books, 1974. First USA Edition, First Printing. Soft Cover. Very Good Minus. 1st Paperback Printing. Vintage Paperback Cardinal Books #C0158, 1954, 1st paperback printing, rare US crime vintage paperback, 8 briliant stories of murder and suspense, great lovers in graveyard cover art by Tom Dunn, nice coy, brighta nd firm, minor wear to edges, VG+. Pinnacle Books. Used - Good. Good condition. Interior stamped. Pinnacle Books. Used - Good. Shows some signs of wear, and may have some markings on the inside. Pinnacle Books. Used - Good. Good condition. Slightly dampstained. Pinnacle Books. Used - Good. Ships from the UK. Former Library book. Shows some signs of wear, and may have some markings on the inside. 100% Money Back Guarantee. Your purchase also supports literacy charities. New York: Pinnacle Books, 1974. VG except that the top 1" of the front end page has been cut out--apparently to remove the name of a previous owner.. First USA Edition, First Printing. Soft Cover. Very Good. Pinnacle Books. Used - Good. Good condition. New York: Pinnacle Books, 1974. Light edgewear to the covers. Otherwise a clean, tight copy with no spine creases. . Mass Market Paperback. Very Good/No Jacket as Issued. Pinnacle, 1974. Paperback. Good. Disclaimer:A copy that has been read, but remains in clean condition. All pages are intact, and the cover is intact. The spine may show signs of wear. Pages can include limited notes and highlighting, and the copy can include previous owner inscriptions. UK: New English Library, 1974. P.B.O. front cover creased. pages browned.. First Edition. Mass Market Paperback. Good. 12mo - over 6¾" - 7¾" tall. New York, NY, U.S.A.: Pinnacle Books, 1974. First Paperback Printing. Mass Market Paperback. Fair. Cover price 95 cents. Pinnacle. PAPERBACK. 0523008457 Meets the good condition guidelines. Has wear. Five star seller - Buy with confidence! . Good. New English Library. Paperback. GOOD. Spine creases, wear to binding and pages from reading. May contain limited notes, underlining or highlighting that does affect the text. Possible ex library copy, thatâll have the markings and stickers associated from the library. Accessories such as CD, codes, toys, may not be included.